After many months of both construction and curiosity, the Vancouver Island Visitor Centre, located in the Comox Valley, is open and pleased to welcome both tourists and locals alike. To celebrate this momentous occasion, the Visitor Centre is hosting a grand opening party. Home to Vancouver Island’s only taxidermy Vancouver Island marmot, a breaching orca, living oyster display as well as a lush indoor forest, the Visitor Centre exemplifies so much of what Vancouver Island has to offer. Whether it’s your first visit to the Island or your twentieth, it’s worth stopping by the Visitor Centre. 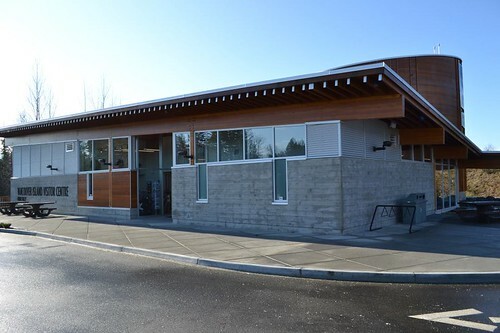 On Saturday, April 28th, make an outing to the Vancouver Island Visitor Centre between 10:00 a.m. and 3:00 p.m. to be a part of the grand opening celebration. The event features First Nations dancing and carving, treasure hunts and face painting for the kids, a BBQ as well as building tours. The Vancouver Island Visitor Centre is located at 3607 Small Road in Cumberland, just off the Comox Valley Parkway. For more information, phone 1-855-400-2882 or visit Discover Comox Valley. Nice! 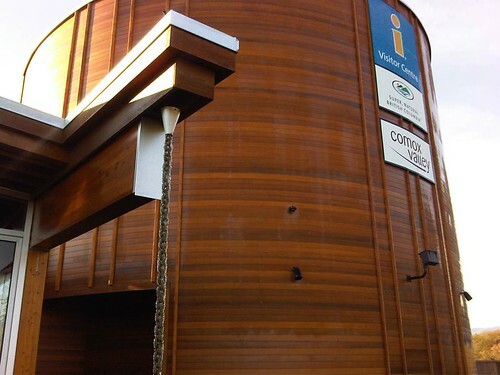 Love the round wooden building… Allan and I saw this being constructed last time we were there!